FanGraphs projects the Braves to finish with the second worst record in baseball. That's a win behind the Yu Darvish-less Rangers and whatever it is the Twins are this year. Projections come with massive error bars. Any wrong assumption gets magnified over a 162 game schedule. Last year, the Braves and projection systems expected something positive from Mike Minor (among others). Instead, he performed around replacement level. So they won 79 games instead of contending in the NL East. Preseason projections can quickly become obsolete. In the case of the Braves, I would not anticipate much upside. Were we to conduct some reductionist analysis, we could talk about Freddie Freeman, four pitchers, and go about the rest of our day. Like the Phillies, a terrible Braves team could open a few opportunities for enterprising fantasy owners. Let's get something out of the way - Teheran is a talented young pitcher. He's the 18th pitcher off the board in NFBC leagues, sandwiched between Jeff Samardzija and Alex Cobb. He posted a 2.89 ERA last season with 7.57 K/9 and 2.08 BB/9. The strikeouts were light in this day and age, but they were good enough. I see a lot of reasons to pass on Teheran this year – especially at his NFBC cost. He's lost strikeouts due to the way he uses his sinker. His stuff easily supports a strikeout per inning. He's naturally an extreme fly ball pitcher, which is why he uses the high contact sinker. Even so, his ground ball rate is tiny (35.6 percent). Like Cole Hamels, he'll receive very little run support. Ask Felix Hernandez how that works. I'm a sucker for strikeouts, which is why I prefer Wood to Teheran. The southpaw has a high effort, deceptive delivery which allows him to strikeout about a batter per inning (8.92 K/9). On the surface, it looks like Wood lost two mph last season, but that can be chalked up to pitching mostly out of the rotation. He neutralizes opposite-handed hitters with a good change up and also features a plus curve. Miller is coming off a strange campaign, which is why his acquisition cost declined from years past. He's currently the 63rd ranked starter by NFBC. A 3.74 ERA looks a lot better than his 4.54 FIP with 6.25 K/9 and 3.59 BB/9. His pitches generally lost effectiveness last season compared to 2013, especially his curve. He'll need to induce more whiffs if he wants to recapture his former prospect sheen. There's upside here, but you're unlikely to find it. Minor scuffled through the 2014 season with a sore shoulder and an…unpleasant…infection (let's not talk about it here). He's currently battling the same soreness and the prescribed treatment is rest. Without knowing more about the situation, it seems like a more aggressive course of action is needed. I recommend you avoid Minor entirely. The Braves acquired Mike Foltynewicz as part of the haul for Evan Gattis. He has a chance to open the season with the club if Minor lands on the disabled list. He has elite velocity, but he needs to polish his secondary stuff. He looks like a great reliever to me, but the club will try to develop him as a starter. They have elite relief covered. Cody Martin and Jason Hursh could also factor into the rotation. Hursh is a solid prospect who requires more seasoning. Martin is described as possessing fringy stuff despite solid results in the minors. Wandy Rodriguez is likely to earn a job by default, but he's a non-factor for fantasy owners. Since he entered the league, no reliever has outperformed Kimbrel. Aroldis Chapman may have edged him out as the best reliever in baseball, but that's no fault of Kimbrel's. He has a career 1.43 ERA with 14.82 K/9 and 3.36 BB/9. Last season was more of the same. When batters swing at his fastball, they whiff one-third of the time. The curve induces whiffs in over half of all swings. Ridiculous. Behind the Golden One is Grilli. He should be a good source of holds despite coming off a 4.00 ERA. He pitched well after a mid-season trade to the Angels, so it's easy to treat his 20 bad innings with the Pirates as an aberration. He still struck out over a batter per inning while limiting walks. He's a 38-year-old, so beware father time. Despite what's projected to be the worst offense in baseball, the Braves actually own a number of modestly interesting players. Freddie Freeman is the elephant in the room. It's telling that he managed only 78 RBI in a career high 708 plate appearances last season. Remember, the team still had Jason Heyward, Justin Upton, and Evan Gattis in those days. Now he's supported by a muddled nest of ifs and maybes. Expect opposing pitchers to frequently avoid Freeman. He's relied on high BABIPs to post useful batting averages. I worry how his loud contact skills and average power will play when he's not getting strikes. Despite posting several great offensive seasons, he's never exceeded 23 home runs. The presence of Nick Markakis is supposed to provide more base runners for Freeman. I also have my eye on Cuban import Dian Toscano, or at least I would if he hadn't fallen into a black hole immediately upon signing. The club is hurting for outfield depth and Toscano is described as a low-power contact hitter with quality plate discipline. That sounds like a ready-made two-hole hitter, but it appears he'll open the season in Triple-A. I want to like Andrelton Simmons, but he continues to disappoint at the plate. He's an excellent contact hitter, but he hits too few line drives and way too many infield flies. The result is a low average. He flashed 20 home run upside in 2013, but the Braves instructed him to rein in his power hack. If you're familiar with Carlos Gomez's swing, Simmons would occasionally emulate it. Shortstop is such a thin position that there's still a place for Simmons on fantasy rosters. You'll be hoping for a breakout rather than another replacement level season. A number of players come with a glimmer of hope. Zoilo Almonte is likely to platoon with Jonny Gomes. He's a switch-hitter who has demonstrated decent power in the minors. Youngsters Jace Peterson and Jose Peraza could carve out roles during the season. Peraza is the better of the two. Entering his age 21 season, he's a high-contact, low-power speedster with 50 steal upside. Don't expect any on base skills, but his speed could still lead him to bat atop the order. The Braves are the 29th team in our power rankings. An incomplete rotation and miserable offense limit the club's fantasy value. The best players like Teheran, Wood, and Freeman are hurt by the supporting cast. 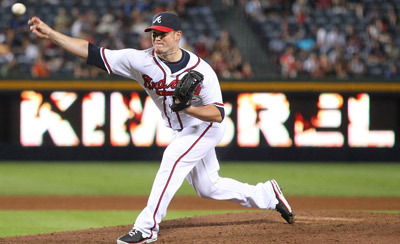 Only Kimbrel can be expected to perform similarly to past seasons. Anytime we're presented with a terrible club, there is usually an opportunity to find value. In this case, Peraza and Toscano look like two players who could quietly enter the scene. Platoons should open up plenty of streaming days with guys like Almonte and Gomes.